Group 3. For the oldest ones. DescriptionGraco Booster mode. Group 3. Reminder: a specific retaining system (car seat or booster seat) is mandatory in France for children from birth up to 10 year old. 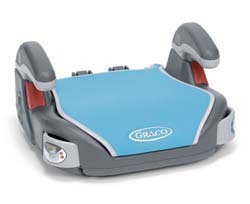 For a higher child safety and better comfort, we recommand rather to rent a booster seat with backrest. Not sure what model to choose? Read our blog article "what car seat should I rent?" and/or contact us. Strictly follow provided instrusctions for use. Car seatbelt routing clearly indicated. Suitable for children 22 up to 36 kgs. For the oldest children (up to 10 year old - about 36 kgs), this simple booster seat will allow safe journeys for car family trips. This model is very easy to use, light and not cumbersome (you can easily put in the the car trunk when not using it). Of course, and as all our baby equipment for rent, this product is carefully cleaned between each rental period. Philippa from Paris: "I live in France and had a need for two booster seats for some visiting friends. Babytems was quick to respond to my request, the service was without fault and the equipment perfect for my needs. Drop of also great. Highly recommend this company."